The first person in Scottsdale to score the new iPad walks out of the Apple Store at the Scottsdale Quarter with his toy. You've got to hand it to Apple, they know how to make stuff people want. In this economy, at a time when other industries and other companies within the tech industry are suffering, Apple roars ahead. This week it was the New iPad (or is it the new iPad - all I know is that it's not the iPad 3). 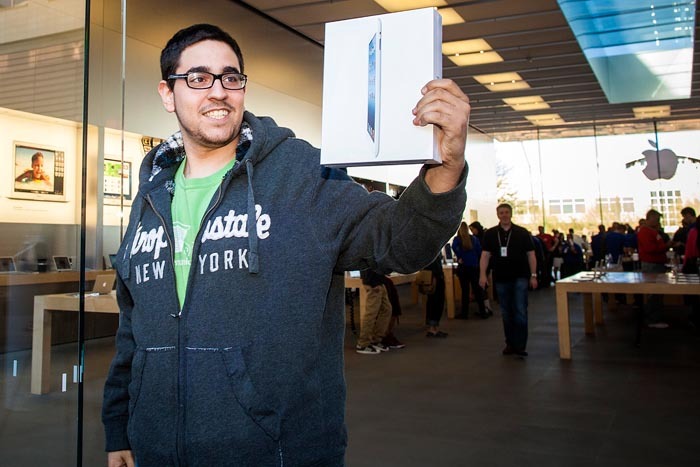 The first day of new iPad sales was no different. At the Apple Store in Scottsdale, (by far the nicest Apple Store in the Phoenix area) there was a long line of people waiting to get their hands on an iPad. The man in the photo got to the store at midnight - a full eight hours before the store opened. He was the first in the store and when he emerged victorious he stopped and chatted with the media about his new toy. As cool as the iPad is, I just don't see one in my future. When Apple comes out with a new MacBook Air 11 inch model with USB3 (instead of pokey USB2) and an 8gig RAM limit (rather than the paltry 4gig limit), I'll be first in line. That's the laptop I'm holding out for. There are more photos from the iPad release in my archive or available from ZUMA Press.